Lucky Gajraj is made of Solid Silver and is very effective Lal Kitab remedy to control Rahu. It is kept in house to control malefic effect of Planet Rahu. Those who are undergoing the Mahadasa or Anterdasa of Rahu shall definately keep Lucky Gajraj with them. If you facing troubles in your work accomplishment and if you have Kaal Sarp Dosha in your chart, it is very helpful. 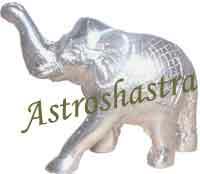 Astroshastra , provides energized Gajraj to be kept in your pocket or on your table to negate the malefic effect of Rahu on your life. When Rahu is malefic in the horoscope, the person faces the following problems like Weak memory, Legal Problems , Problems from / to In-laws, Losses in speculation/shares/lotteries , Lack of concentration , Fear Psychosis , Losses from electricity / electrical departments, Miscarriage /abortions , Financial problems , Plans don’t get materialized. To control the malefic effect of Rahu in any horoscope, placing or keeping Energized Lucky Ganesha with him/her is very effective vedic remedy. It is made up of solid silver and is to be used for astrological purpose. Astroshastra, energize the Gajraj in your name specifically to enhance its effect to control the malefic effect of Rahu in any horoscope. Horoscope with Kaal Sarp Dosha and if there is conjunction of Rahu - Moon or Rahu - Jupiter shall keep this energized Lucky charm with them. This would help to negate the Dosha in the chart.